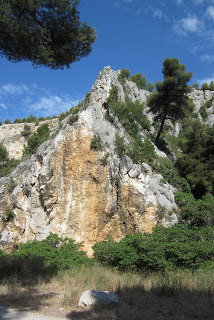 Les Calanques is the name of the national park between Cassis and Marseilles, which was created to preserve the limestone fjords that jut into the sea at this end of the Cote D'Azur. With their magnificent white cliffs, azure inlets and rugged vegetation, Les Calanques are a national treasure well worth keeping in their natural state. One of the sad things about the south of France is its rampant development. Dense housing covers most of the mountains that slope to the sea, obscuring any break between the towns along the coast. For the most part the Cote D'Azur could be re-named Le Cote des Maisons. 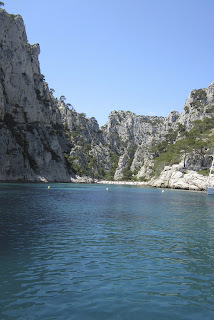 This is why Les Calanques are so special, no one can build there!! It's true, that before the national park was established, there was a villa or two within the boundaries and one of the inlets is a marina, which moors about 300 sailboats. I also forgot to mention the ubiquitous cafes that crop up here and there as pleasant oases for those who have climbed up and down a fjord or two. Still the park has managed to stop the housing developments of today and the quarry companies of yesterday. We travel in Europe without a car. This forces us not only to walk a lot more, but also to see a lot more! 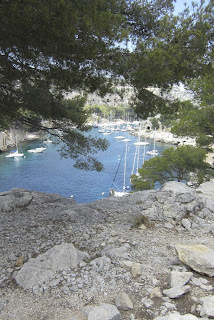 Hence, we set out one morning to walk to the Calanques, for a walk! Little did we realize that we had to walk about a mile and a half on roads that looped up, down and around the rugged coastline, before we actually got to the gates of the park. We were now ready to begin our walk!! Oddly enough, when you are moving, you tend to keep moving, which is why we didn't stop at one of the cafes for lemonade until we had finished the mile and a half walking trail, because again, oddly enough, it's difficult to get going, once you have stopped. Fortunately, the additional mile and a half walk back to our flat seemed much less arduous than the one setting out. "Say not (that) the struggle naught availeth." More on walking and kayaking next post.